MISSION ESL COMPUTER LAB: Mary Cassatt, 1844-1926: She Broke Social Barriers With her Art. From Voice of America. Mary Cassatt, 1844-1926: She Broke Social Barriers With her Art. From Voice of America. And I'm Faith Lapidus with PEOPLE IN AMERICA in VOA Special English. 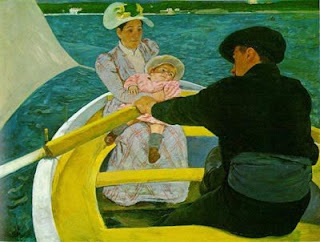 Today we tell about the nineteenth century artist Mary Cassatt. She was best known for her beautifully expressive paintings of women and children. Cassatt spent her life working to change traditional beliefs about art and a woman's role in society. Mary Cassatt was born in eighteen forty-four near Pittsburgh, Pennsylvania. Her father, Robert, was a wealthy investor. Her mother, Katherine, had a deep knowledge of books, art and the French language. When Mary was seven years old, her family moved to Europe for several years. Mister Cassatt wanted his children to experience European education and culture. The Cassatt family lived in Paris, France for about two years before moving to Heidelberg in modern day Germany. In eighteen fifty-five, Mary's brother Robbie died. Mister Cassatt decided it was time to return to the United States. But first, the family stopped once more in Paris. It was an exciting time to be in that city. Mary and her family visited the Universal Exhibition. This event showed the success of French art and industry. Mary would have seen important works by the most famous French artists of the time. She might also have seen the works of a revolutionary painter, Gustave Courbet. Courbet's art was criticized for its realism. So, he was not permitted to show his work in the exhibit. Instead, he created his own exhibit space nearby. At an early age Mary saw the different movements within the French art world. She would one day be part of this world and would make her own rebellious art. During the nineteenth century in the United States, wealthy women usually did not have careers. Women generally learned how to care for a house. They might learn to play music, sew and paint. But Mary Cassatt was different. She believed that her training in art was much more than a fun activity. She saw art as her future. In eighteen sixty, at the age of seventeen, Mary began classes at the Pennsylvania Academy of the Fine Arts. Her father did not approve of her decision to become an artist. But Mary did not let this stop her. Mary Cassatt worked very hard and was a good student. But she realized that to become a fully trained artist, she had to go to Europe to study. Travel was impossible during the four year American Civil War that began in eighteen sixty-one. So, it was not until eighteen sixty-six that she returned to Paris. For four years, Mary studied in Paris and other smaller towns in France. Because she was a woman, she could not study at the French Academy of Fine Arts in Paris. Instead, she created her own program of study. Cassatt worked hard copying the great paintings hanging in the Louvre museum. She also studied with different teachers. 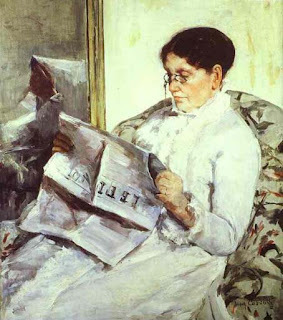 In eighteen sixty-eight, one of Mary Cassatt's paintings was accepted into the Paris Salon. This show was operated by the government-controlled French Academy of Fine Arts. Two years later, the Salon accepted another of her paintings. Her career as a successful artist had begun. In eighteen seventy, Mary Cassatt returned home to Pennsylvania. But life at home was not easy. Her father was no longer willing to support Mary's artistic career. She tried showing her paintings in New York City, but no one bought them. She exhibited her art in Chicago, only to lose them all in the Great Chicago Fire of eighteen seventy-one. Luckily, a religious center in Pittsburgh, Pennsylvania hired her to copy two famous religious paintings that hung in Parma, Italy. Mary Cassatt had found a way to return to her beloved Europe and be paid to work. In Parma, she soon began to receive wide critical praise for her art. 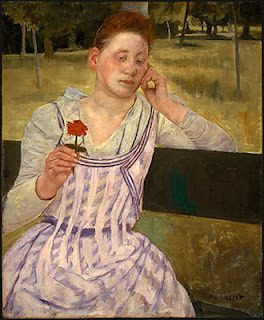 Cassatt continued to have her works accepted in the Paris Salon. But she began to tire of the traditional values of the official art world. The Salon was very set in its ways. It rejected works that showed bright colors, unusual subjects, or any form of experimentation. Cassatt had to make a decision: Would she paint in a way that received public approval or in a way that she found interesting and exciting? She found her answer in a group of rebellious painters known as the Impressionists. Mary Cassatt once said that she used to go to a Paris art seller's shop. She would flatten her nose against the window to take in all that she could of the art of Edgar Degas. She said his paintings changed her life. In eighteen seventy-seven, Edgar Degas came to her studio and asked her to join his group of artists who called themselves the Independents. This group later became known as the Impressionists. These artists included Claude Monet, Auguste Renoir, and Camille Pissarro. Degas and the other artists had decided that they would no longer follow the rules and restrictions of the Paris Salon. These artists refused to submit art to the Salon. Instead, they formed their own exhibition in eighteen seventy-four. Today, the works in this historical show are some of the most famous paintings in the world. But at the time, many people condemned their art. Degas and the Impressionists were interested in painting the effects of light, and how the human eye sees subjects. The Impressionists used bright colors, rough brush strokes and thick paint to show light and movement in its many forms. They also painted subjects of everyday life. Traditional artists generally painted imagined scenes from history or literature. Mary Cassatt said this about Edgar Degas' invitation to join the Impressionists: "I accepted with joy. I hated conventional art. I began to live." 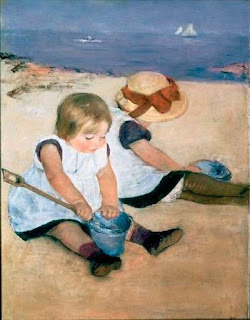 Cassatt spent two years producing works to show in the Impressionists' next exhibit in eighteen seventy-nine. During this period, her parents moved to Paris. Finally, Robert Cassatt had accepted his daughter's skill, and praised her growing success. Paintings from this period include one of her mother reading a newspaper. It is called "Reading Le Figaro." Mary Cassatt's loose brush work skillfully captures the effect of the sunlight in the room. In "Woman and Child Driving"
she masters the effect of outdoor light and draws attention to a child's glowing face. Her works show people in private moments. Her subjects act naturally, and are sometimes caught in movement. Mary Cassatt did not stay with the Impressionists for long. She chose freedom over being part of a set art movement. In the eighteen nineties Cassatt started to experiment with making prints. She was influenced by a series of prints from Japan. She repeated their simple but very modern forms in her own prints. They include "La Toilette," an image of a woman bathing. In "Maternal Caress," a few simple lines express the deep love of a mother for her child. Mary Cassatt sold many copies of her prints when she exhibited them in Paris. And, she would continue to explore the subject of mothers and children in her paintings. 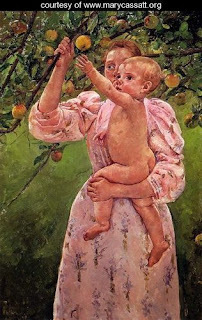 In "Baby Reaching for an Apple"
Cassatt shows a mother gently holding her child as the baby looks with wonder at the fruit. "The Boating Party" shows a mother and child in a small boat. The diagonal angle of the painting is very bold and inventive. Cassatt held another successful exhibit in eighteen ninety-three. One critic said that no artist had painted "the poem of the family" with such feeling. 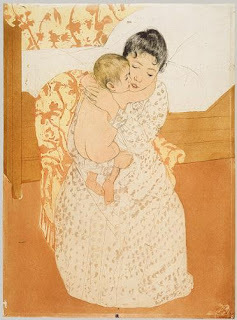 Mary Cassatt had become one of the most successful artists of her time. Cassatt bought a house in the French countryside and used her success to help others. She advised young artists. She also helped wealthy American art collectors choose fine works of art by Impressionist painters. She believed it was important that Americans be able to study such fine art at home. Thanks to her efforts, many Impressionist paintings became part of American art collections. Cassatt also worked hard to support women's right to vote in the United States. Mary Cassatt won many top awards, but she refused to accept most of them. She said she was an early member of an independent art movement and was against juries, medals and awards. Cassatt continued working and travelling into her late sixties. She later was forced to stop painting because of her failing eyesight. Mary Cassatt died in nineteen twenty-six at the age of eighty-two. She spent most of her life working to change traditional beliefs about art, artists and a woman's professional role in society. Today, her paintings are in the top museum collections in the world. And I'm Bob Doughty. For transcripts, mp3s and podcasts of our shows go to voaspecialenglish.com. Join us again next week for PEOPLE IN AMERICA in VOA Special English. 1. During the nineteenth century, wealthy women didn't have ______ . 2. Mary Cassatt's art was deeply influenced by ________ . 3. Mary Cassatt wanted to her painting to be a __________ . 4. As a child, Mary Cassatt and her family lived in France and ___________ . 5. Mary's father didn't approve of her decision to be __________ . 6. Two of Mary Cassatt's paintings were accepted by the ____________ . 7. ______________ , a painter she greatly admired, invited her into the impressionist group. 8. The subject of many of Mary Cassatt's paintings is women and ___________ . 9. Another name for this selection could be _________ . b. "A Great Woman Painter"
c. "Impressionism in the 19th Century"
d. "Art of Paris and Germany"
answerb. "A Great Woman Painter"
10. This story is mainly about ________________ .